includes a modular IP65 protected front panel with touch screen. 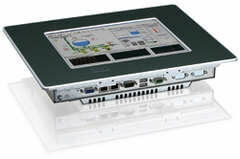 The Kontron Micro Client IIA can be implemented with either SATA, CompactFlash or Ethernet boot functionality. This makes it the perfect fit for all common serverorientated HMI client technologies. I/O Standard 2x USB, 2x LAN 10/100/1000, 1x RS232, 1x RS232/RS422/RS485 opt.